When I visit home I love hanging around the open air market in my village. It is common for each village in Thailand to have an open air market in the late afternoon till the evening from 1 to 3 times a week. We call it ตลาดนัด – Talad Nad – and it is the best way to get fresh and dry ingredients for cooking when traveling to the wet market in town in the early morning is not an option. It is similar to the Seattle Farmers Market, but the stalls are a mix of merchants and farmers. I often enjoy snacks from the food stands, take pictures, and pick up a few things for myself and my family. You can find everything from fresh ingredients to cooked food and seasonal fruits. One durian season I had a chance to reconnect with an old friend, the durian farmer shown below. He had loaded his freshly picked durian fruits—that had dropped from the tree that day—into the back of his motorcycle basket. The durian flesh stays good in the fruit for a few days. 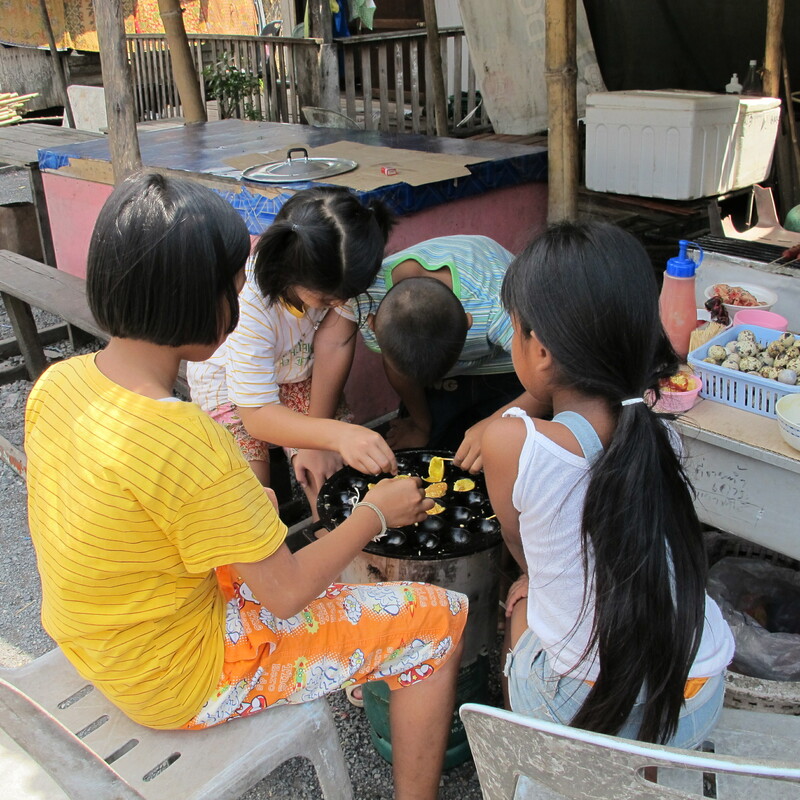 He sold his durian at the Talad Nad and around the village. What was left was likely to become durian paste candy. The peak season for durian is in June and July. During that time, farm families will turn their large surplus of durian into durian candy. In Kamala village, durian plantation owners are famous for their durian candy, a rare specialty commodity. When durian season comes, make sure you ask to be on the list for freshly made durian paste candy, a gift of pride from the village. Photo is a courtesy from Old Phuket Town Community and was taken on July 6, 2013 on Kamala Agricultural Day. In the above photo, the durian paste candy is wrapped in plastic and rolled into a tube. Last year, due to a drought, no durian paste candy was available. My first post on durian was written in 2011. It was called “What is the durian and how to open it?” It showed, in detail, how to open durian. Now you are going to learn how to remove the flesh from the stone after you open the fruit. The pulp from 5 durian fruits roughly this size will yield about a kilogram of candy. The best and easiest to remove the pulp from the seed is to use both hands to squeeze out the seeds, discard them, and leave the durian pulp in the container. In July 2006, I asked around during one of my visits to Kamala village, Phuket, Thailand and learned that my friend’s family was making durian paste candy. I was able to take pictures and videotape the process. Following is the recipe from my notes and video interview. The durian plantation owner—her name is Pranee as well—said there is no secret to making durian paste candy. 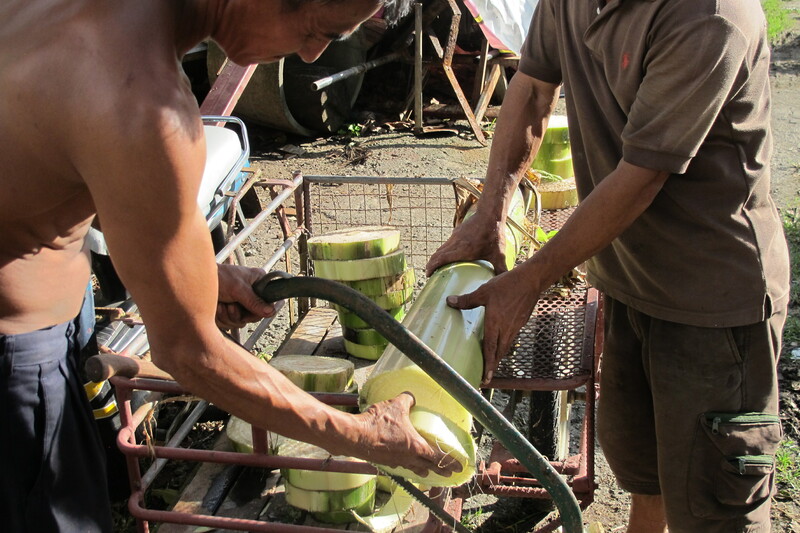 It simply requires patience, time, and strong arms to stir the durian constantly. It usually takes her a whole day in preparation. The candy can be 100% durian, or it can call for adding 100 grams of sugar for every kilogram of durian pulp. It is cooked over a low, simmering heat and stirred until the flesh turns into a sticky brown candy. It takes about 6 hours, from morning to late afternoon, until the pulp becomes a shiny lump and it can be rolled into a ball and rolled like a marble. After it cools down, it is wrapped in plastic and rolled into a tube. It is made to order for sale in a half kilo or smaller. The price varies from year to year. This year’s price right now in Phuket is around 200 baht, which is about $7. Pranee’s tip for small plantation owners is that she saves durian pulp in the refrigerator each day until there is enough pulp to fill the pan. This way it becomes worth her while to prepare the candy with a full pan of durian pulp while she takes care of her granddaughter at the same time. While I was learning from her, I enjoyed watching villagers going by. I had a chance to taste the durian candy shown above. There wasn’t any durian candy last year because the dry and short monsoon season limited flower productivity, but this year there is a great surplus of durian, which predicts that there will be a lot of durian paste candy going around in the village. I can’t wait to taste it again this year. This is a typical durian paste candy – ทุเรียนกวน – Thurian Guan found in American Asian markets for a short period of time each year. 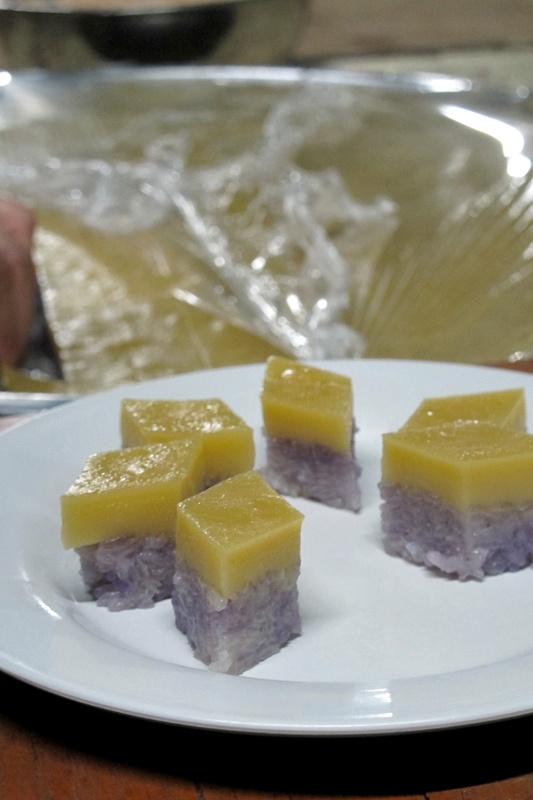 It is also known as Thurian Guan, Durian Guan, Durian Paste, Durian Fruit Roll, Durian Cake and Durian Jam. It is available at online market such as Amazon , Temple of Thai and Import Foods under durian paste. As soon as I arrived at the Phuket Airport, my brother broke the news to me that my friend’s mother had passed away—the grandmother of the boy who asked for the quail eggs. Looking back, I treasure the time I had spent with her in December 2012. She had talked of my childhood and we talked about the many things that came to our minds. In Thai culture, elders are living treasures of our community; we always pay respect to elders. For instance, on Thai New Year’s Day (สงกรานต์ – Songkran) and on wedding days, a blessing from the elders is a village custom. Her funeral was held in our village monastery hall. More than 25 dining tables were set up so that when friends and relatives from near and far visited and gave their condolences, the foods and drinks could be promptly served. 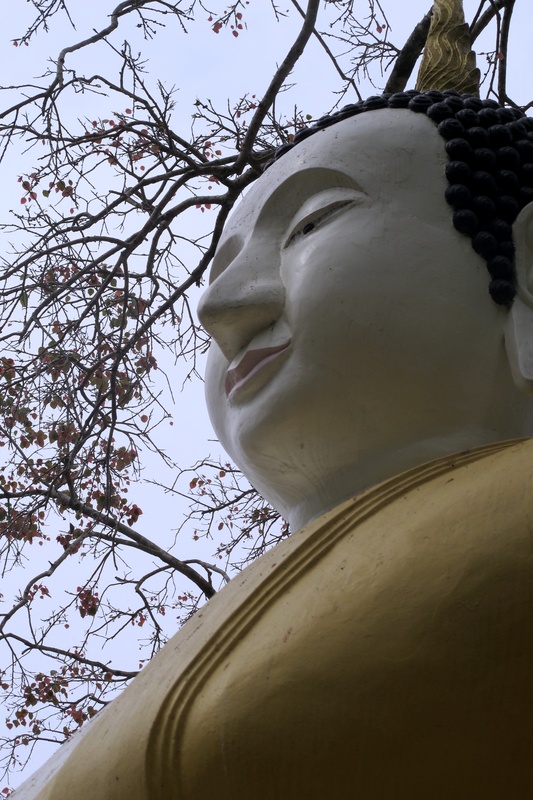 I spent a few hours each of my first two days in Phuket at the funeral. The funeral ended with the cremation at a crematorium nearby in the monastery. 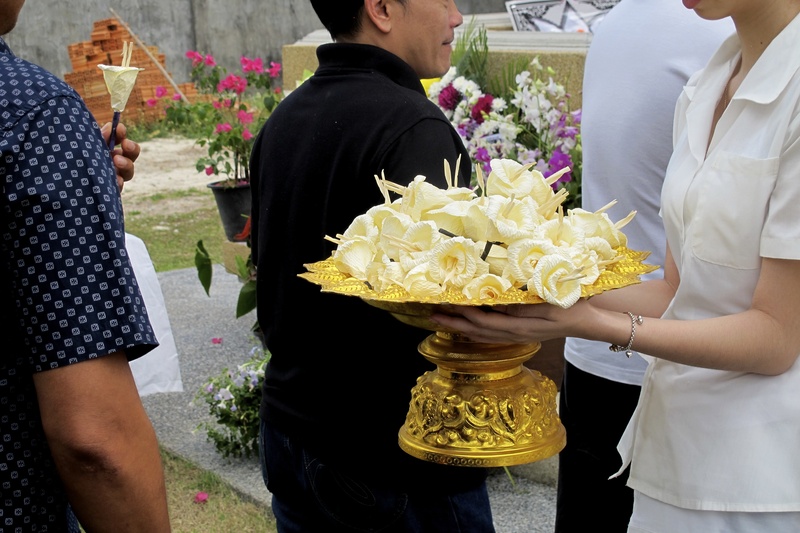 ดอกไม้จันทน์ – Dok Mai Jan – a sandalwood flower, is placed next to the coffin near the crematorium, a chance for all to pay respect and say their final farewell. That day, people stopped to pay their respects in order of status and seniority. First there were monks, then the vice governor of Phuket, the woman’s children, and all relatives, friends, and all neighbors. I placed a Dok Mai Jan and thanked her for her contribution to my childhood and our community. And like other Thais, I asked for her pardon for any physical or verbal act I might have done against her—intentionally or unintentionally—and that all be forever forgiven. In Thailand, a funeral typically lasts for three to seven days and takes place either at the person’s home or at the monastery. Nowadays, it is often most convenient to have the funeral at the monastery. 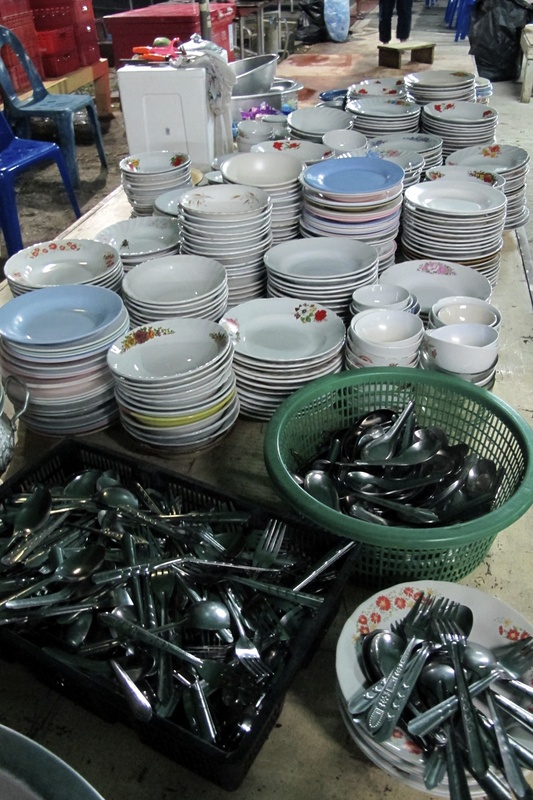 In my village, the monastery is equipped with everything that the community needs to cater a successful event, from cooking utensils to serving dishes, and dining tables and chairs enough for 800 guests. Thirty years or more ago, all cooks and servers were volunteers from the community, and kids would learn culinary skills, dish cleaning, and serving skills at such a function. With today’s lifestyles, however, local caterers are depended upon to buy ingredients and prepare two meals each day. Close friends and families provide additional help dishing up and serving. The Phuket cuisine served at the funeral and the flavors of my hometown gave me a complete feeling of homecoming. After the cremation, I found the lead cook resting in the kitchen, her long hours of intensive cooking done. I was delighted to get a chance to interview Pee Yoiy -พี่่ย้อย บ้านดอน, a caterer and a head chef for the event. Pee Yoiy and her team did amazing work providing two large meals a day for five days. During a funeral, food is typically prepared for 300 people for lunch, and 500 people at dinner time. About 600 people came for a full meal for lunch before the cremation. They came to eat and eat well, to connect, to rebond and to celebrate the life of the deceased. A donation to the host is expected, but the amount is for making a merit -ทำบุญ – Tum Boon – to share the expense of the funeral with the family. The Thai culture is a food culture, and providing a meal at a funeral is very important. In the Thalang district, on the Island of Phuket, Pee Yoiy and her team caters large events such as weddings at private homes or rental places. Funerals and the ordinations of new monks are typically held in the temple kitchen. You can reach Pee Yoiy at พี่่ย้อย บ้านดอน 084 8487228. 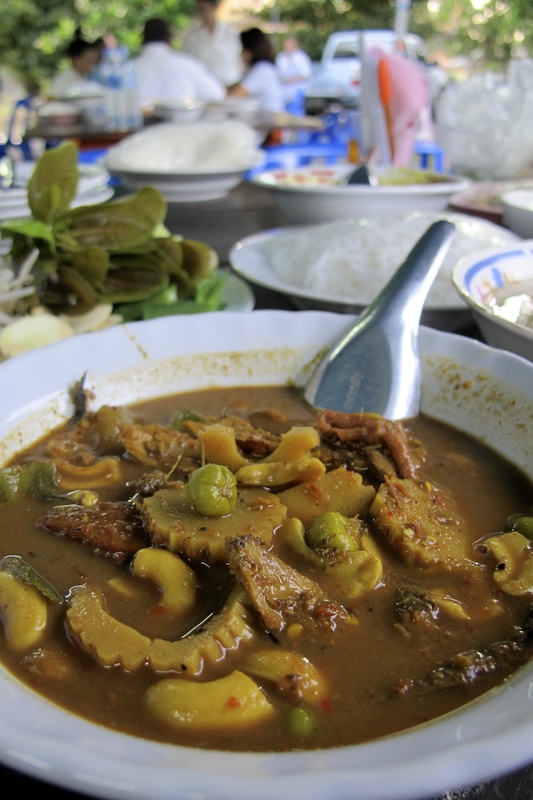 What are local favorites in Phuket cuisine? Gaeng Tai Pla – แกงไตปลา – Southern Hot and Spicy Vegetable Curry is a southern Thai dish that uses fermented fish stomach as a base for curry. 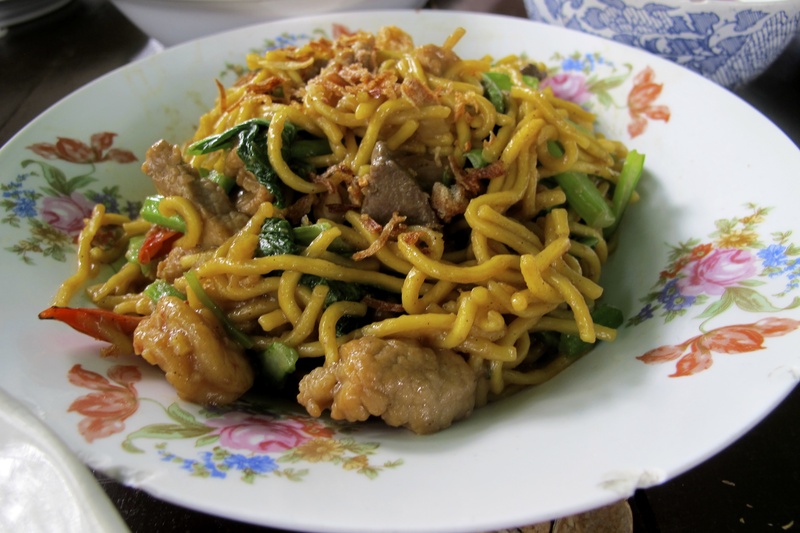 The dish is then enjoyed with fermented rice noodles or steamed jasmine rice. Moo Hong Phuket – หมูฮ้องภูเก็ต – Braised Five-Spice Pork Phuket Style in soy sauce. Pork belly or pork shoulder is braised with hard-boiled eggs in a five-spice powder with a dominant cinnamon flavor. 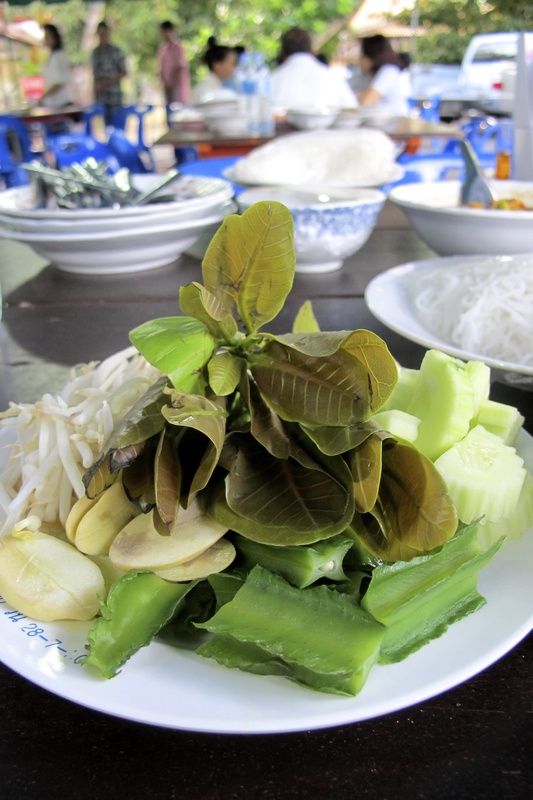 A vegetable accompaniment— ผัก เก็ด – Pak Kred— is the most important complement to the main dish in southern Thailand. It is ideal to graze on Pak Kred during a meal that has one or more spicy dishes served with rice or fermented rice noodles – ขนมจีน – Khamon Jean. It can be made of any vegetables or fresh herbs. The photo above shows cucumber, blanched wing beans, sliced white turmeric, bean sprouts, and young leaves from the cashew-nut tree. 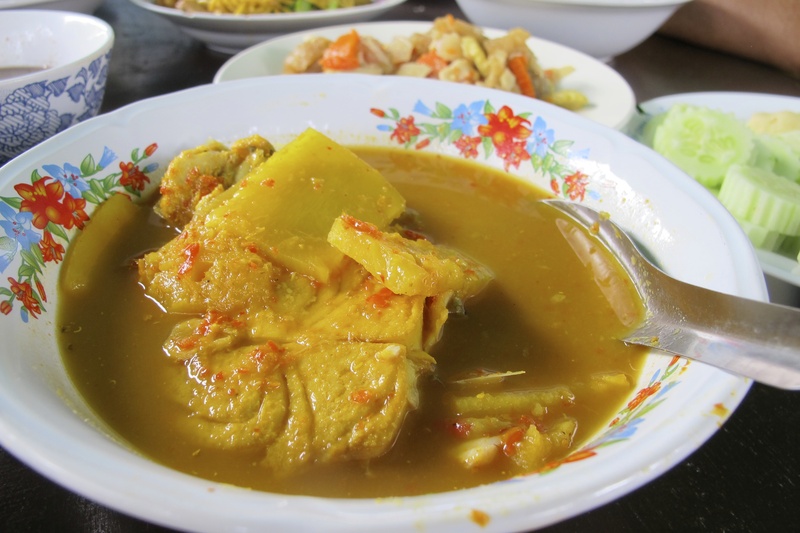 Gaeng Som Pla – แกงส้มปลา – Sour Curry Fish is a typical curry of southern Thailand. Plenty of dessert is available throughout the function. 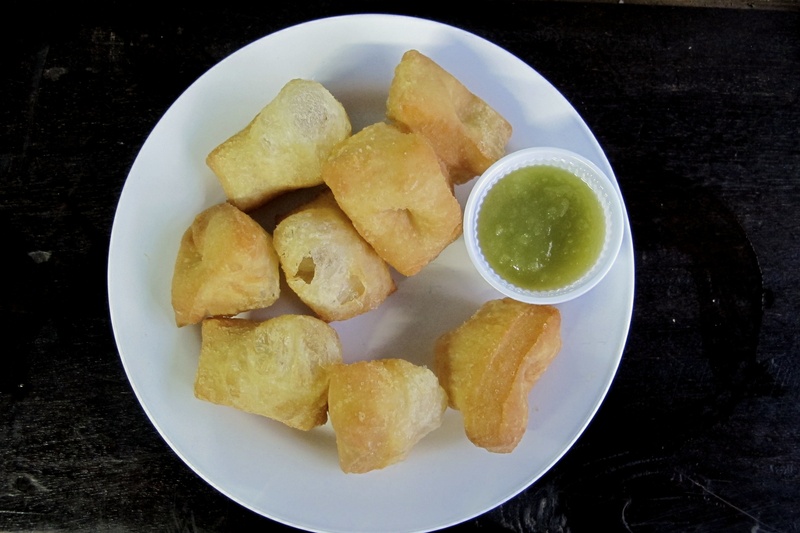 Pa Tong Ko – ปาท่องโก๋ – Deep-fried dough sticks with pandanus-infused custard is served as a snack or dessert. Everyone in my Thai family was born and lives in Phuket, as we have for many generations. This is also true for many of Phuket’s over 200,000 natives, though there are about one million people living on Phuket Island today. Despite all of the changes, one place remains almost timeless. This is Rawai Beach, where the pace of change is slow compared to other parts of Phuket. 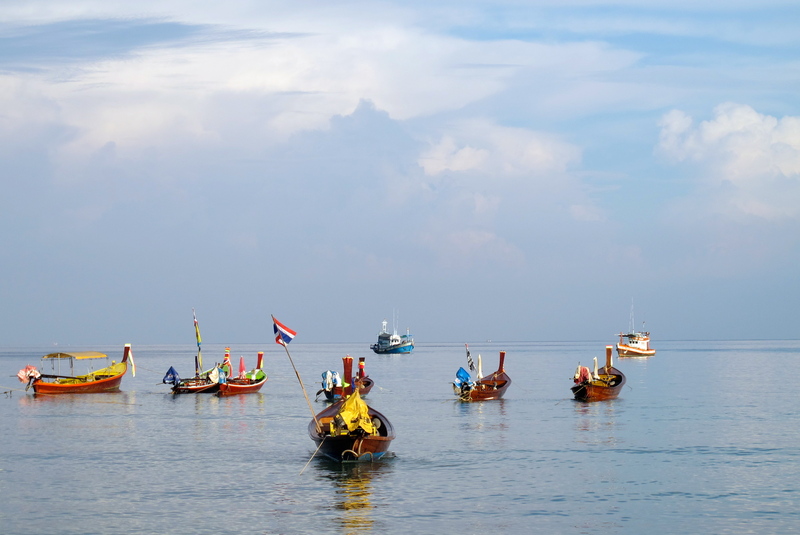 So where do Phuket natives escape to on the weekend? Rawai Beach – หาดราไวย์. There we dine on seafood as we did for many generations before there were so many foreign influences, enjoying a typical menu of grill seafood or blanched cockers with Phuket seafood dipping sauce. In my next post I will show you exactly what we ordered the last time I was at Rawai Beach with my family, and how we ate it. This may help you understand our cuisine and culture. I hope you will enjoy my personal story of how my family eats and travels. When you get a chance to visit Phuket, I hope that you, too, will have a chance to eat like a local. Each visit I make to Phuket provides fun reunion time with my family. Almost every weekend during my short visits we bond over food, whether it is fresh home cooking, or take-out from Talad nad – ตลาดนัด or nearby restaurants. Sometimes my family and I will take a little adventure travel to another end of the island or to the nearby province of Phang Nga. This trip my sister-in-law and I had a desire for seafood Phuket style. As always, we visited Talay-Zep restaurant, the scene of countless of our reunion dinners. My friend Kularb -กุหลาบ – and her husband Pho – โปั – own Talay-Zep Seafood and Wine Restaurant, which is on Rawai Beach Road among 15 other Phuket seafood restaurants. We enjoyed a big seafood feast, which I will share with you in my next post. Today, however, I will share just my family’s favorite dish: Horseshoe Crab Salad with Mango. Just like Anthony Bourdain, most of my family consider this a delicacy dish—though I myself was not convinced to eat these eggs, which are the only edible part of the crab. In fact, the horseshoe crab is not a crab at all, and it does not have edible flesh like other crabs. It is more closely related to spiders and scorpions, a living fossil that has remained virtually unchanged for millions of years. But now, after doing some research, I have learned more about the risks involved in eating horseshoe crab eggs, and how to avoid them, so I may take one bite the next time around. Nevertheless, I asked Kularb to share her knowledge of horseshoe crab eggs and her verbal recipe with you. Today I am not encouraging you to cook, but to read and learn about something you may never have heard of before: Horseshoe Crab Egg Salad – Yum Khai Mengda Talay – ไข่แมงดาทะเล. Horseshoe crab is not difficult to cook, but the person who removes the eggs—or roe—from the horseshoe crab must know the correct procedures to do this to prevent the other inedible parts of the crab from contaminating the eggs. If the eggs get contaminated, you can fall sick with dizziness or the symptoms of food poisoning and complications of the digestive system. Kularb suggests that you only harvest the eggs from cooked horseshoe crabs. The eggs, which are found in the belly area, can be green or orange-colored, about the same size as salmon roe but with a firmer, crunchy texture and an interesting flavor. There are two ways to prepare horseshoe crabs before removing the eggs. One way is to place the whole horseshoe crab in boiling water and cook it until the eggs are just cooked. Another way is to place the horseshoe crab on the grill until the eggs have cooked, about 5 minutes. Kularb notes that it is a very difficult task to remove the eggs from the shell and that it requires a skilled cook to prepare the eggs. She or her husband prepares the horseshoe crab eggs for her restaurant. Yum Kai Meng Da is the only way that Thais usually prepare horseshoe crab eggs. Kularb’s verbal recipe is the same as my green mango salad recipe so I hope you enjoy this recipe even beyond the horseshoe crab egg salad. For everyone to enjoy this salad without the risk, I have created a Mock Horseshoe Crab Egg Salad, which can be prepared substituting Israeli couscous cooked al dente with a touch of fish sauce in place of the crab eggs. With the mock salad recipe there is nothing to worry about—just enjoy the delicious salad! You may use horseshoe crab eggs if desired, but do so at your own risk and with an awareness of the risks involved. Cook horseshoe crab eggs according to Kularb’s instruction and set aside. To make the salad dressing, stir fish sauce, lime juice, palm sugar and chili powder together in a large bowl. Stir well until the palm sugar is dissolved. Then stir in Israel couscous or horseshoe crab eggs, shallot, green mango, Chinese celery, and cashew nuts until well combined. Place lettuce leaves on the serving plate and top with salad mixture. Serve right away. Should You Eat Horseshoe Crab Egg? 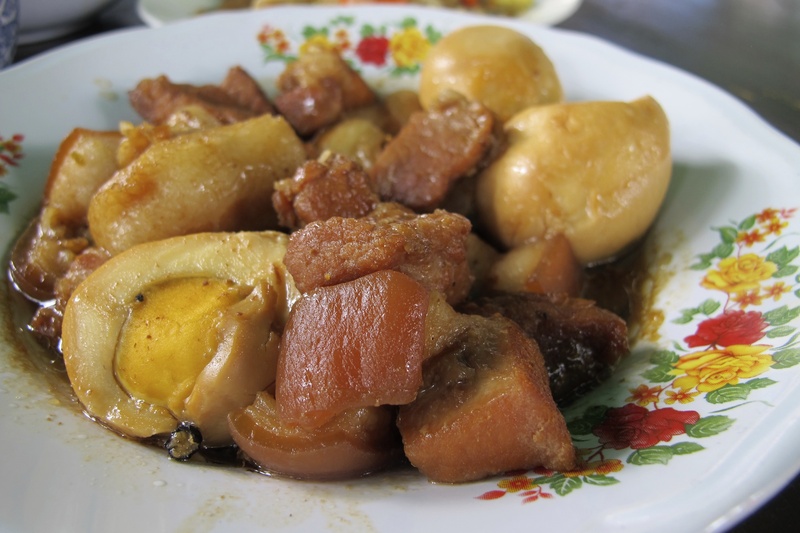 When I was in Phuket last month, on my way to Talad nad – ตลาดนัด – an open air market, my friend’s son asked me to get him some hard-boiled quail eggs please: “Khai Nok Krata Krub” -ไข่นกกระทาครับ. He said it with such expectation, his simple request tickled my fond memory of this petite egg. I loved quail eggs when I was young, just like any Thai kid. On my way back from the Talad Nad, I gave him a bag of a dozen hard-boiled quail eggs. I was glad to find them, afraid that if I had not he might be disappointed. He rolled the egg on the table until its thin shell cracked all around, then pinched the shell to break it and remove it. He popped the whole egg in his mouth with delight. It is a healthy choice for a snack. I could not help but taste one myself when he asked to share with me. I enjoyed the delicious egg with its rich, creamy, mouthful of flavor. Welcome home! Quail eggs are usually served in one of two basic ways: as a 3- to 4-minute hard-boiled egg, or as a sunny side up fried egg. And now you are about to learn to fry quail eggs Thai style. 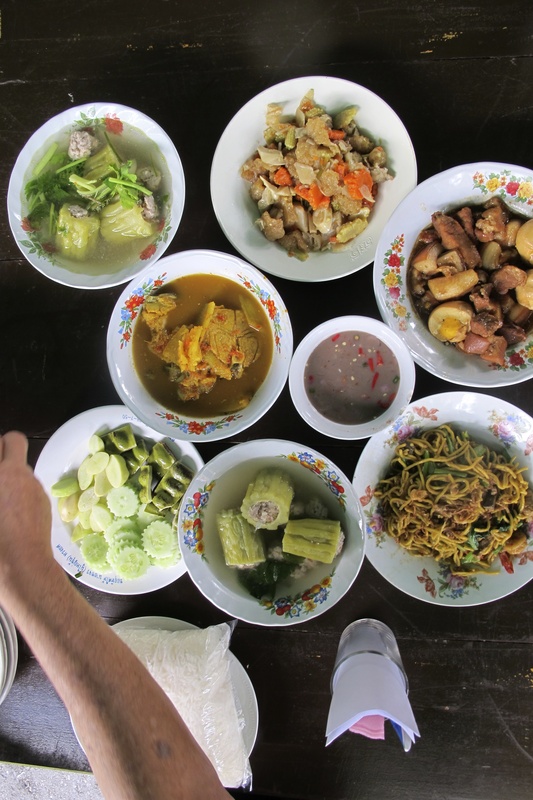 Please enjoy the photos showing a Thai cooking style from a southern Thai fishing village. They are from my trip to Surat Thani in 2011. 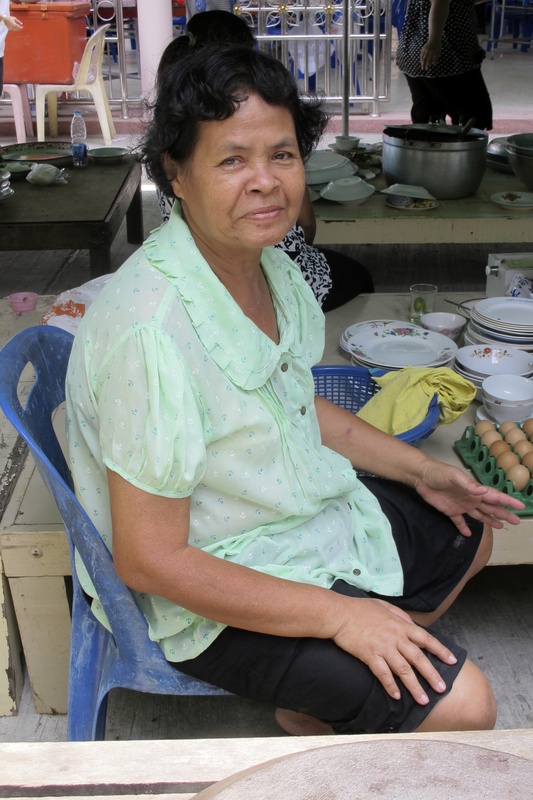 This technique has a special name: “Khanom Krok Khai Nok Krata” – fried quail eggs in a Khanom Krok Pan, which is similar to a pancake puff or aebleskiver pan. 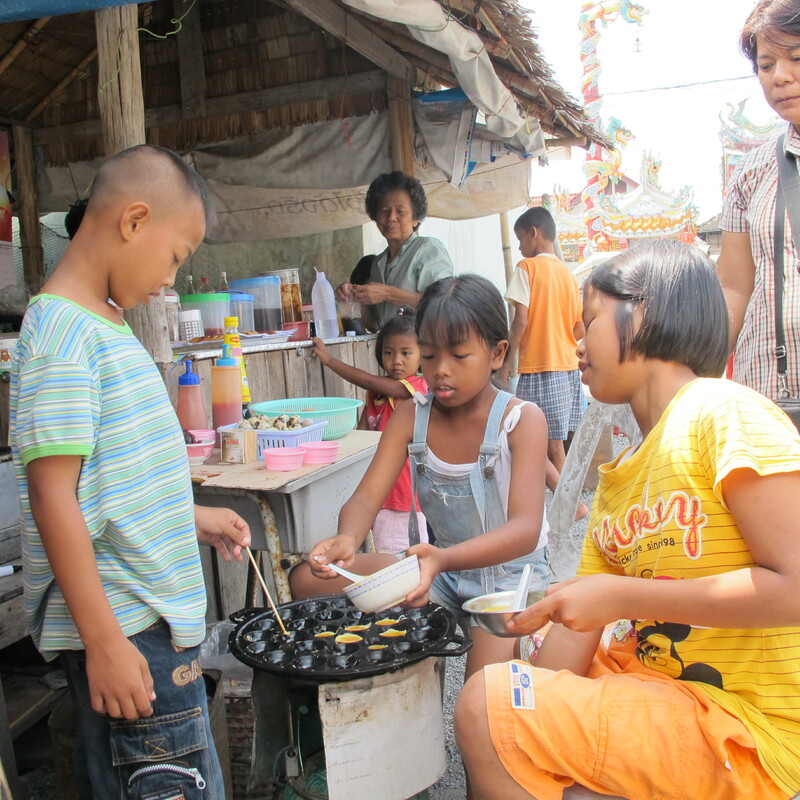 This group of friends was preparing their own healthy snacks on the weekend from chicken eggs and quail eggs in a Khanom Krok pan. They were teaching and learning from each other. I hope this will inspire you to try it at home. 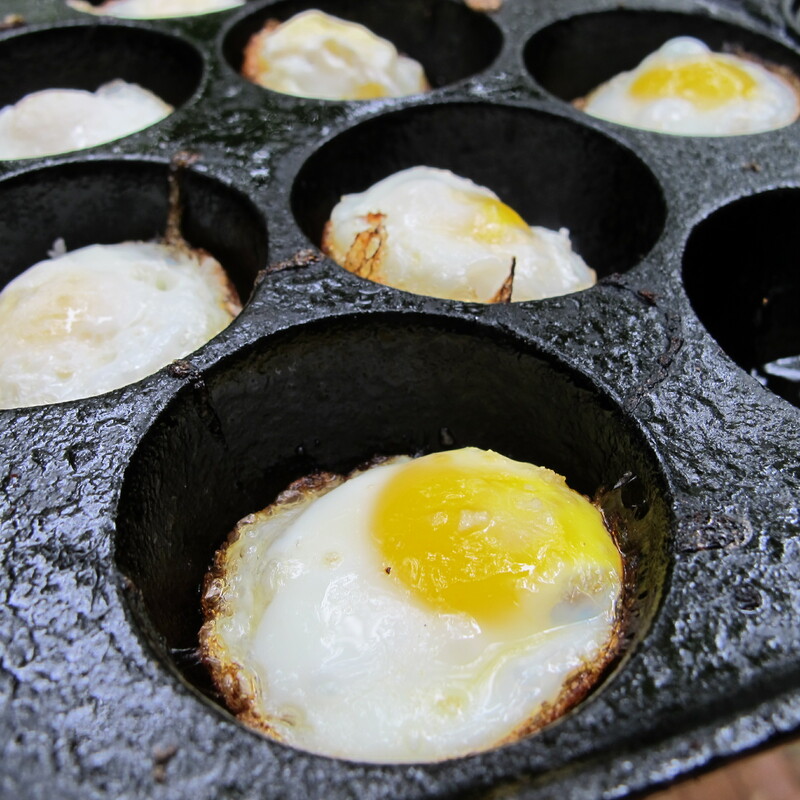 Fried quail eggs in Khanom Krok or aebleskiver pan. Quail eggs are a delicacy in Western Europe and North America, but in Southeast Asia, quail eggs are abundant and inexpensive. 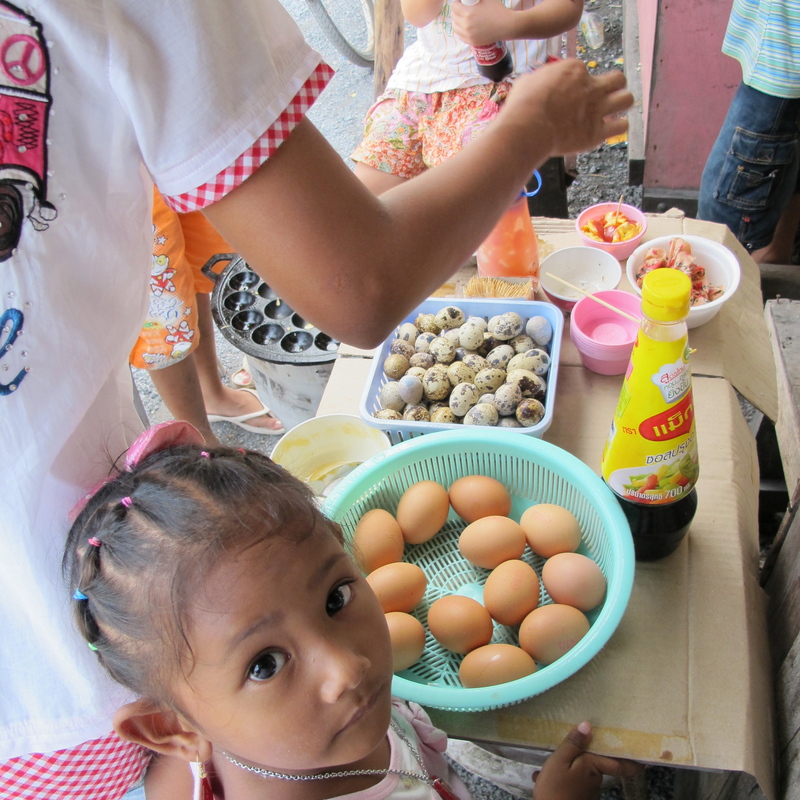 At Talad Nad wet market, you can find fresh quail eggs at the egg vendors, and at the snack vendor you will often find fried or hard-boiled quail eggs ready for you to enjoy. In the Seattle area, fresh quail eggs are available at Asian markets such as Viet Wah or Uwajimaya for $2 a dozen. You can also find them at the Pike Place Market Creamery where a package of 1o eggs from California are $4.75. At University Seafood and Poultry, Washington quail eggs are $6.98 for a pack of 10 eggs. Heat a Khanom Krok pan or Ebleskiver pan on medium-high heat. Use a heat-proof pastry brush to brush the pan with a generous amount of oil. When the pan is hot, crack quail eggs and drop one egg into each hemispherical indentation. Let it cook until the bottom of the egg is crispy, the egg white is cooked, and the egg york is slightly cooked, about 3 minutes. Cook longer if you wish the yolk cooked more. Remove the egg with a metal spoon that fits the size of the indentation. Repeat the cooking until all the eggs are done. Serve with Maggi or Sriracha sauce; use one or two drops of each per egg. Pranee’s note: In some cultures, slightly raw quail eggs are preferred. These basic fried quail eggs can be a snack, or incorporated into a fried egg salad, or a side dish to a meal. Once again I found myself along Kamala Beach taking a leisurely walk—Dern Kin Lom—เดินกินลม—in Thai this means “walk to eat the wind.” I loved watching what was happening on the beach and wasn’t sure if I was walking slower, or the beach was getting longer, or I was simply spending so much time talking to people along the way. I knew for sure that I took quite some time taking pictures and talking to the villagers who were fishing leisurely for a type of fish called sand whiting. At early morning, the whole family together, gone fishing – ไปตกปลา. 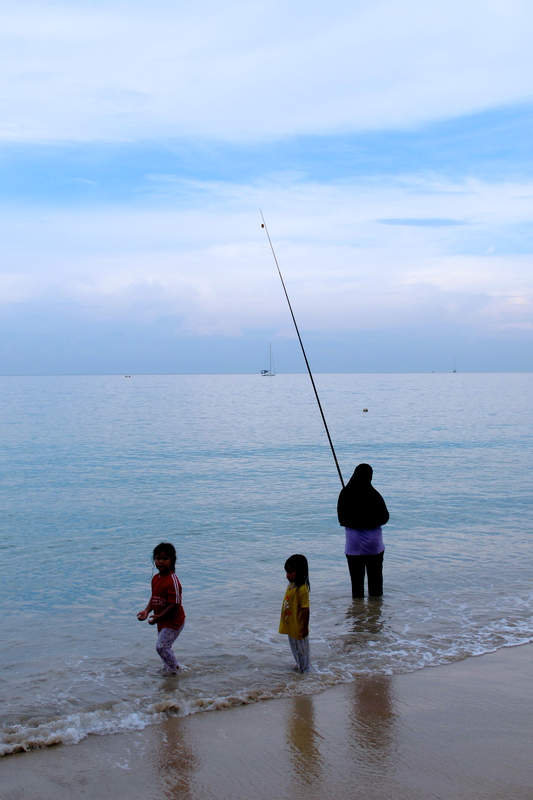 Families enjoy the rays of sunrise and fishing for sand whiting. 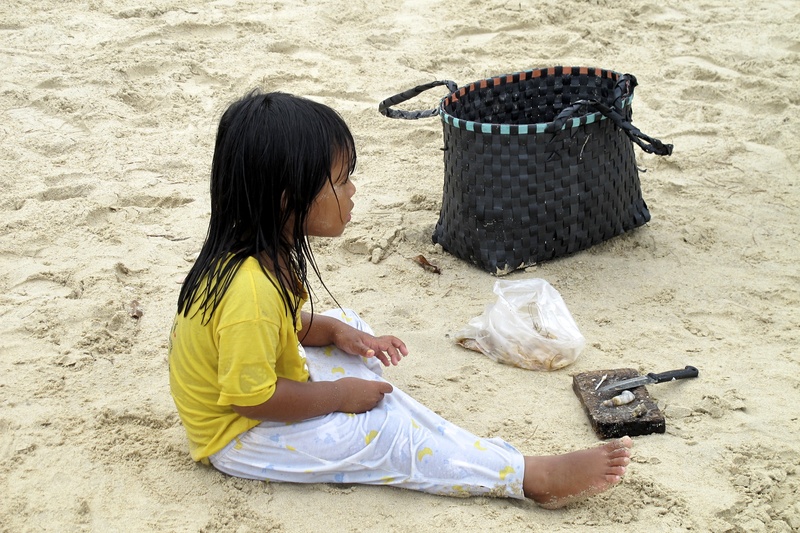 While mom fishes and enjoys her solitude, the children are at play with the sand and the waves. A white sand beach makes a great playground. Shrimp are used for bait for sand whiting fishing. 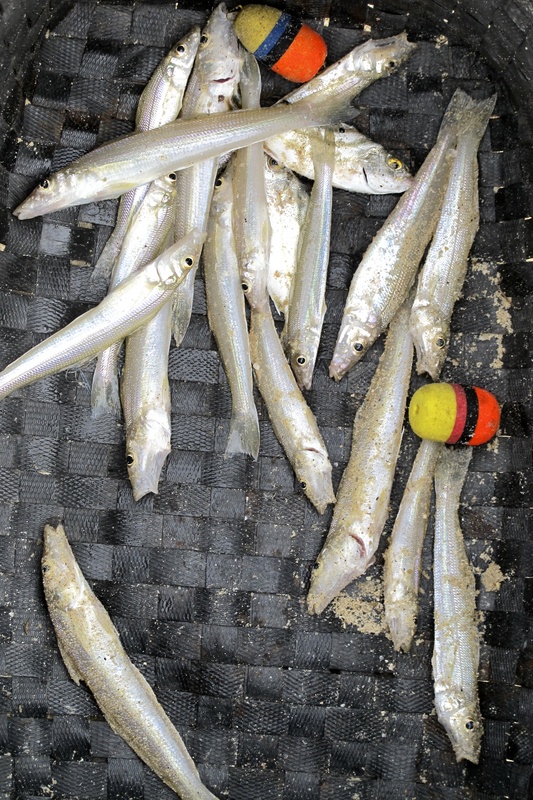 Sand whiting – ปลาทราย – live in shallow areas along the coast in both the Pacific and Indian oceans. 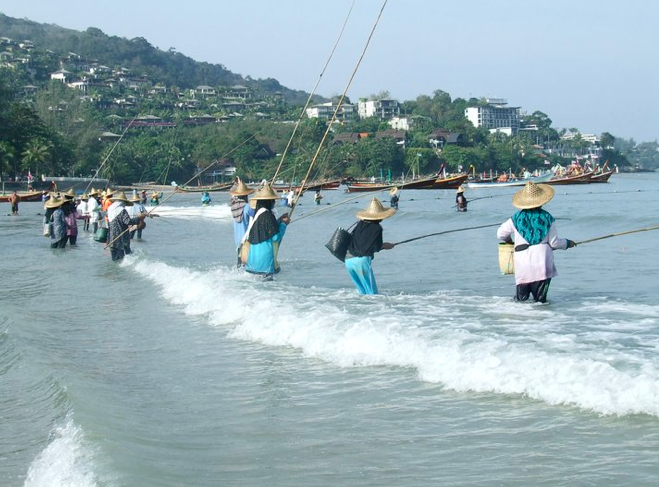 Kamala Beach has a nice sandy beach, a perfect habitat for sand whiting, which live on bugs and small shrimp. A full-grown sand whiting is about 6 to 8 inches long, with a thin, narrow body about 1-inch wide. It has a delightful sweet flavor and a firm texture. Kamala villagers have a passion for sand whiting fishing. It is a tradition as old as the village itself. 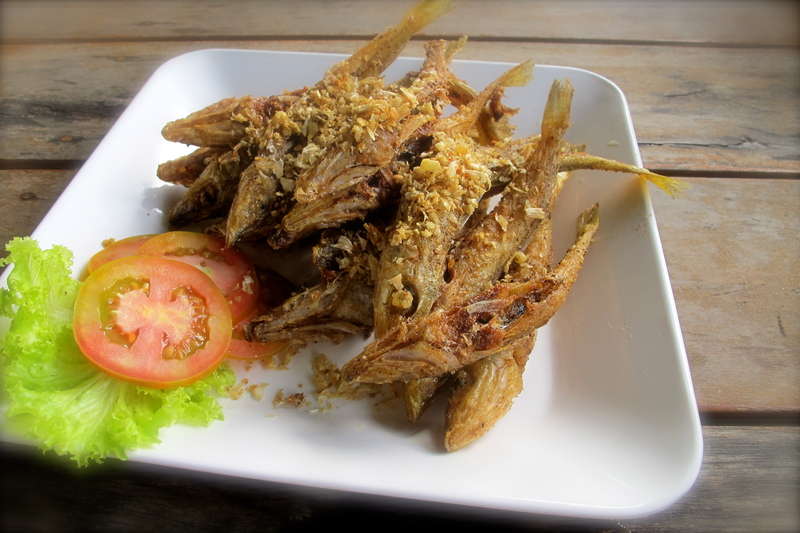 For a Thai culinary delight, look for fresh sand whiting on local restaurant menus. The most popular dishes are Kratiem Prik Thai (with garlic and pepper), tom som (sour soup), tod khamin (fried with salt and turmeric), gaeng som (sour curry) and my grandma’s favorite, tod tao jeow (fried with salted soy bean). The photo above is of Kratiem Prik Thai Pla Sai from Tha Maprow Restaurant in Phuket. 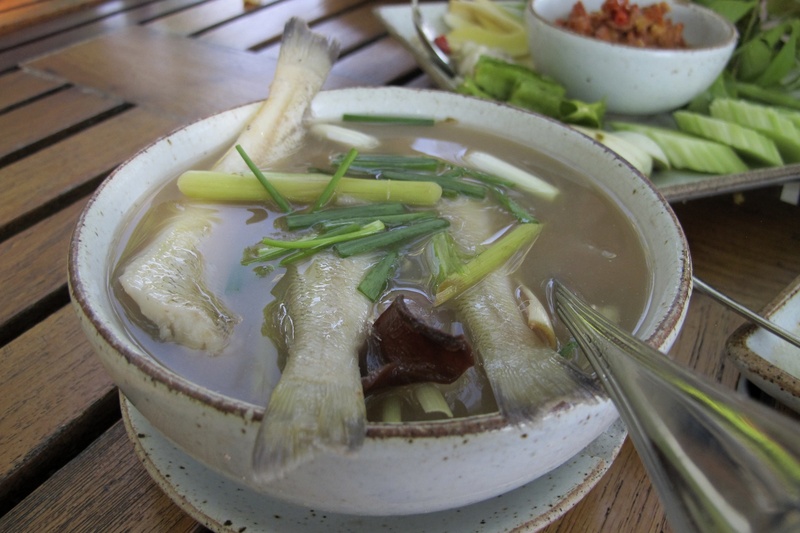 At Kan Eng Restaurant at Chalong Pier, our family ordered Tom Som Pla Sai – Sand Whiting Fish Soup – a simple soup to savor the freshest sand whiting. I hope you will enjoy our family recipe. 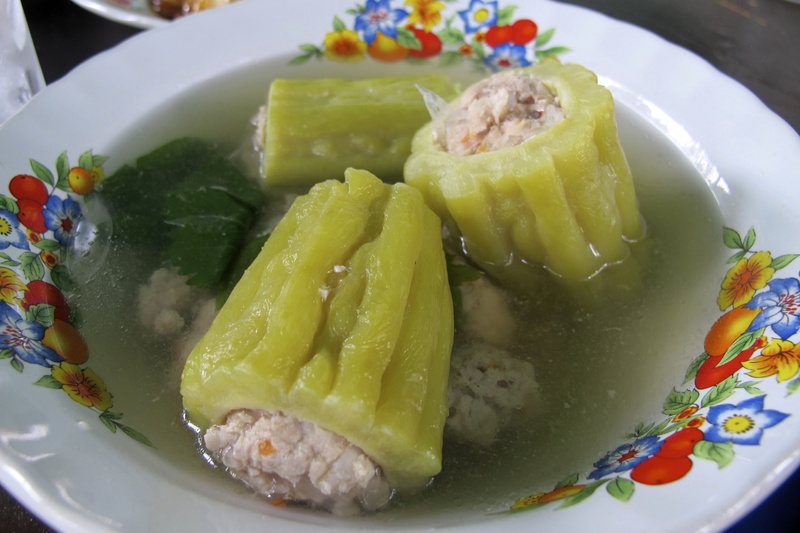 It is typical of the recipes that you will find in Phuket and other Southern Thai kitchens. Tom Som is a basic sour soup with a hint of sweet from the freshest fish. 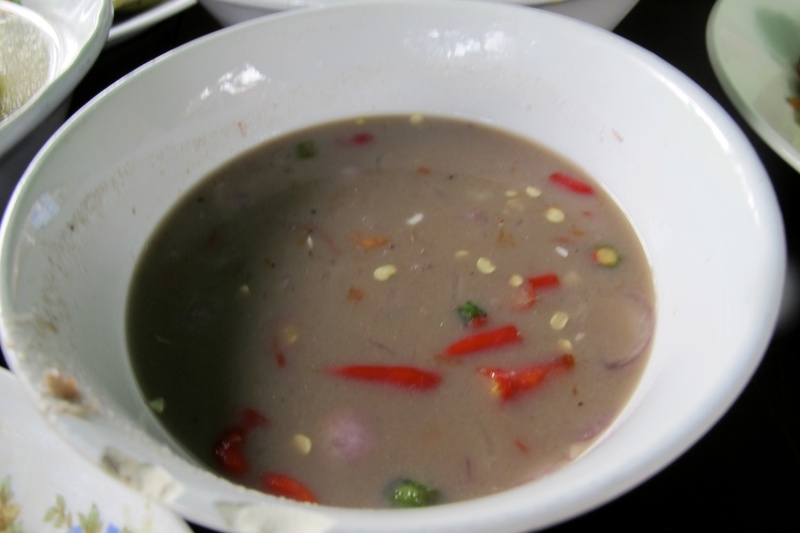 It is a typical sour soup in the Southern region of Thailand where sour fruit is used to give the dish its sour flavor. Each province has it owns preference among the sour fruits, such as som khaek or Asam fruit, salak, hibiscus or young leaves, and tamarind or young leaf. The word “som” has two meanings: one is “orange,” or “sour taste.” We also use som to call or identify sour tastes such as som khaek or asam fruit for example. Most sour fruits contains citric acid; when they are added to soup or curry dishes there is no need for vinegar or lime juice. An important part of learning the art of Thai cooking is understanding the sophisticated use of sour fruits to balance the sour flavor in Thai soups and curries. In America, substitutions for the sour fruits include sorrel leaves, tamarind, and Jamaican hibiscus. To make lemongrass and shrimp paste broth, bring water to a boil in a medium size pot on medium high heat. Add shrimp paste and Asam fruit or tamarind concentrate. Stir until shrimp paste is dissolved. Add lemongrass and shallots and let mixture boil for 5 minutes. Place fish in the boiling broth, which should be slightly covering the fish. Cook until the fish changes color and becomes opaque and the size is a bit smaller—about 3 minutes. Stir in salt. Remove from heat and serve. November full moon shine, loi Krathong, loi Krathong… For Thais and visitors alike, once you have experienced the November Full Moon Festival in Thailand, the experience will stay with you forever. I arrived in Phuket just a week ago due to a family emergency. Thankfully, my mom’s health is no longer critical, and I have had a chance to visit places and participate in activities with my family in between each visit to her at the hospital. I am lucky to have a chance to enjoy Loi Krathong with my family here at our village. Our last Loi Krathong together was 13 years ago. Loi Krathong day is one of joy, fun and hope. It is a ritual in our culture that enables us to celebrate yearly to have fun, make a wish, and to let go. I hope you will enjoy sharing my day in Thailand on Loi Krathong Day, and knowing a little about how a traditional krathong, a floating decoration or boat, is made. Be sure to check your calendar for the date of the November Full Moon Festival before planning a visit to Thailand. Suksun Wan Loi Krathong – สุขสันต์วันลอยกระทง – Happy Loi Krathong! A saw is used to cut the trunk of a banana tree into small, disk-like bases. 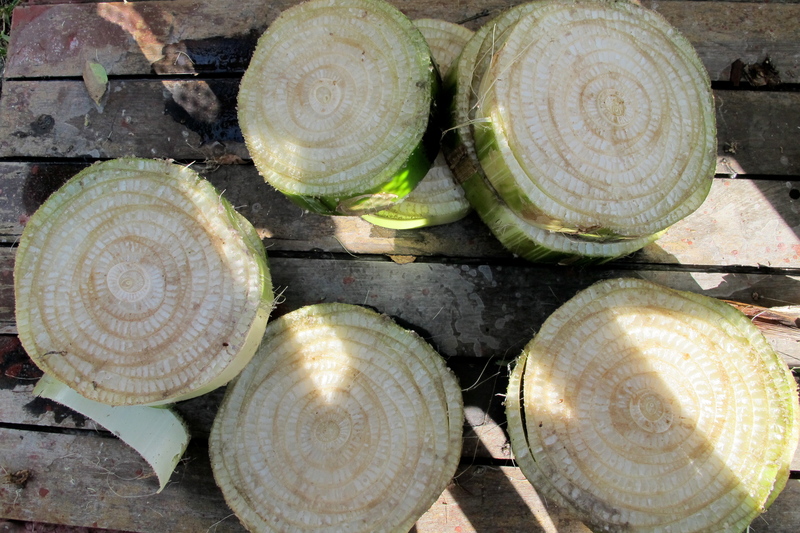 Small slices of banana trunk make a traditional, biodegradable base for a krathong. 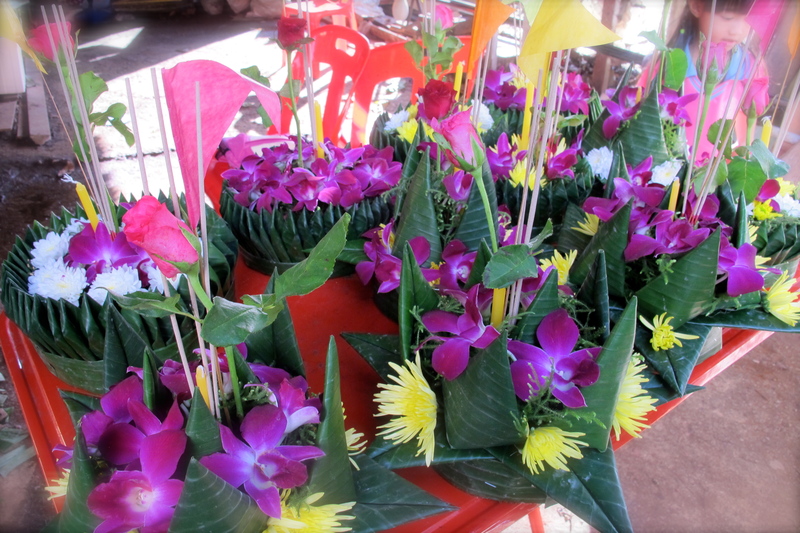 The banana trunk is full of air pockets, which is perfect for keeping a krathong afloat. Banana bases are covered and decorated with banana leaves and flowers. The full moon of the 12th Thai lunar month is Loi Krathong. When we were young, we were always excited about this special time. We made our own krathong using banana trunk parts for the floating device and decorated it with folded banana leaves or other green leaves. Then we added any flowers that were in bloom in our or our neighbor’s garden. Finally, we added three incense sticks and a candle. Before letting go of our krathong to the river or lake, we each added a few items to our own krathong, like small clippings of our fingernails or hair—things that were symbolic of letting go—and some coins. When we arrived at the lake we would spend a peaceful moment under the stars and the light of the full moon. After lighting the incense sticks and the candle, we would kneel and thank the Goddess of Water – Phra Mae Khongkha พระแม่คงคา. Then I would make a wish for my family’s good health and happiness, and all of the things that I wanted to let go. Next I would place my krathong on the water and, with my hand, gently wave the water to push the krathong forward. 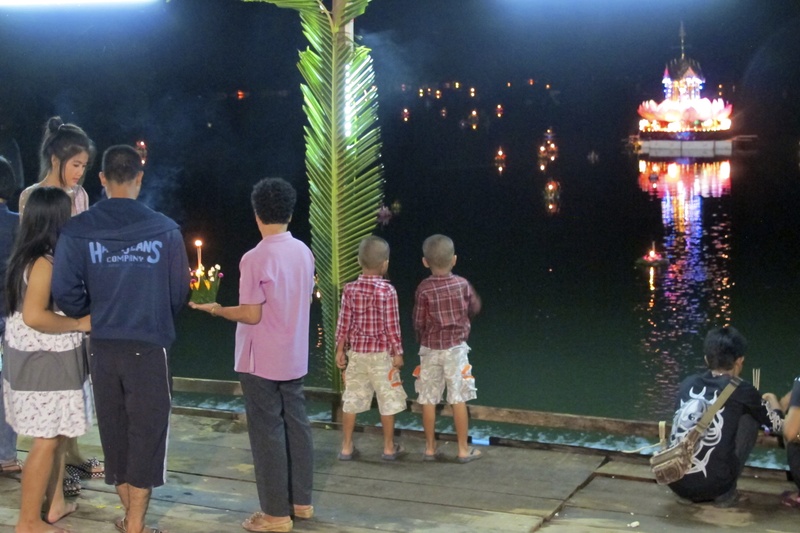 As the krathong drifted away, we watched it float away and let go of all things needed. 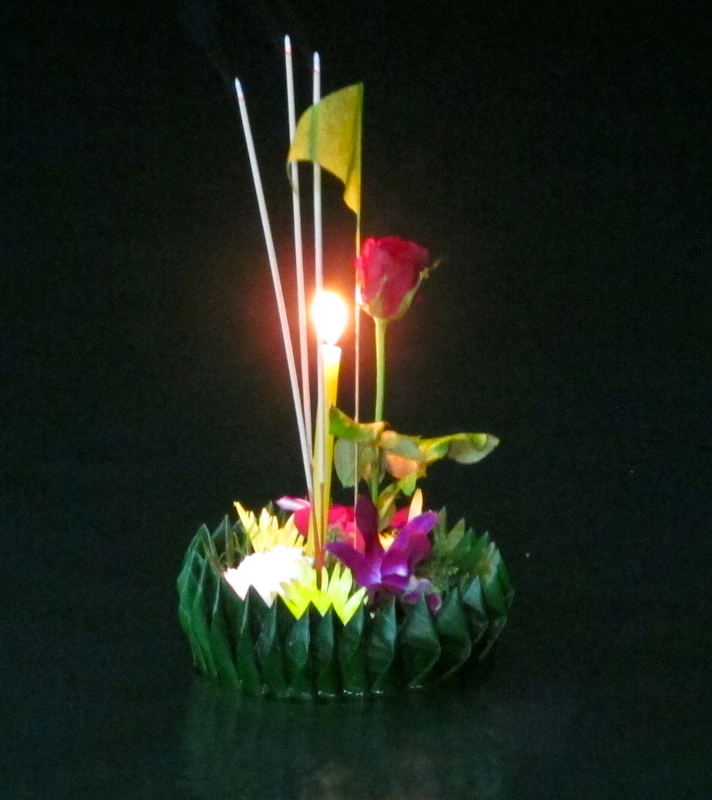 As the krathong became small, we headed home with a great sense of renewal!